There are many moving parts and there is a lot of information passing before our eyes. This is my version of a summary snapshot as we move into Summer 2018. What did I forget? Please add your thoughts below. 6 quick tips, links and areas to consider as we move forward. 2. Get a sense of what’s out there. 3. See where the ML vendors are working to add to our current workflow. Some examples: Carestream, Fuji and IBM. 4. Take an intro ML class online – for free. 5. Own this paradigm shift. Once we have an idea of how developers think, we can offer helpful feedback. “I love my EMR” said no one ever. Let’s be involved in this tech shift. When your institution adopts an algorithm, insist on a system to provide user feedback. There are so many areas to improve within radiology and between radiology and our clinical counterparts. Be creative. Think big. We are at the very beginning of this new time in radiology and quite frankly you could probably navigate the rest of your career and avoid any significant change. March 18, 2015 was the first day I started my daily morning routine and published an article on that in October of that year. Answering the phone at work has been a noticeable change. At work today, listen to how others and you answer the phone. I used to think answering the phone was not my real job. I was trained to be a radiologist. And during that training, any time the phone rang it was a distraction. But during residency I noticed that no matter how curt I was on the phone, it kept ringing. As a staff I decided to at least be nicer, but it still frustrated me. The phone rang. I got frustrated. I can’t predict when the phone will ring, but I can choose my reaction. Over the past 3 years of making time for myself each morning, I have been able to put a little space between things I cannot predict and my reaction. Now the phone rings. I take a slight pause and answer like a calm professional (most of the time). Of course my ringing phone is almost always a fellow provider looking for help. I make time to help and I am happy to do it (most of the time). You’ve made it this far in your career so you know you can google lots of resources, this one is a decent start. 10percenthappier.com No affiliation to me. There is no doubt image recognition will be an increasing aspect of our radiology practice. Now what? In addition to the obvious next question on everyone’s mind – how can we use it? here are 3 more. 1. How can we better predict which patients need scanning? Will it be clinical decision support? Will new legislation help or hurt? Can we use the rest of the clinical, social, genomic and family history to better care for patients overall, to included proper imaging? 2. With that, is there a system to support ordering providers, on not just imaging utilization, but working with lab, blood, pharmacy, physical therapy and the many other teammates standing by to help with patient care. Can we decrease variability, improve accuracy and offer more value to the patient and the system? 3. Who is going to carefully follow incidental findings? Does the average radiologist know who is supposed to come in next month for their follow-up scan? Should this duty be taken on by radiology? Can we borrow systems from our colleagues in sales and make a Patient Relationship Management platform like their CRM (Customer)? If ML algorithms are expected to find more than I can, how can we prep for this now? There will be many RSNA updates over the next week, I’ll be following to see who is thinking about radiology fitting in the bigger picture. Have fun in Chicago and hope to see you there next year. As we watch the medical imaging future unfold, there are reasonable questions to consider. As a radiologist, I am very excited. I welcome the the upcoming changes and new tools being developed as we speak. While the computer science and data analytics experts create these tools, I challenge my colleagues to create a framework that best utilize these tools and elevate the standard of care. A machine learning algorithm can find things that I cannot. This is happening right now and it is impressive. My first question is, what if the study has no findings? How could we avoid an unnecessary study to begin with? The financial, time and possible radiation cost could be avoided. Can we apply deep learning algorithms to clinical scenarios and avoid the CT radiation to a 11 year boy with belly pain for a possible appendicitis and ultimately has enteritis? In a similar vein, why does a common emergent CT scan start at the diaphragm and end at the symphysis pubis? Over the years we have found if the patient complains of pain from ribs down, we’ll probably find something in there. Can we tailor the exam? If there truly is pain at McBurney’s point in the right lower quadrant, can we scan a smaller area? For younger patients the radiation dose savings can add up. Finally, when these systems become so efficient at finding masses, nodules, cysts, focal thickening and small fluid collections, how do we follow them up? We have a decent amount of them now and the system is inefficient at best and non-existent at worst. Who will lean forward to this space? Radiologists, primary care or our computer scientists and data analyst colleagues? Let’s create the framework to expect nodules and carefully track them. I for one want to avoid a situation where a family member is diagnosed with advanced lung cancer only to see a small nodule on the edge of an abdomen CT scan which included the lung bases a year ago. These are reasonable short term goals. The horizon is broad and to tell you the truth, I am looking forward to the next, next thing. We can provide insightful questions for the machine learning engineer to answer; provide supervised learning guidance throughout the process as well. Like the technical cofounder, the clinical cofounder wants to create a product or service and provide value. Medical training however can be as much a hindrance as it helps. In medical school, and subsequent residency, we are drilled on careful attention to detail for each patient. Unless you are in a leadership role, public health or preventive medicine, you rarely think of treating a group of people. This is the opposite of scalable and this is the opposite of value added to a growing company, mostly. By using skills learned while caring for one patient at a time, the forward thinking clinicians can lift his or her head above the noise to see trends. We can identify pain points in our workflow and recognize them in our colleagues. We can make changes in workflow and assess efficiency. We can measure diagnosis per patients per day. These front line observations are critical for a founding team to create the first version of a product that clinicians will find valuable. The medical tools created and given to us can be flexed, and broken if needed. Electronic health records can be compared to banking, travel or social user experiences. Why can Expedia predict where I am going but the radiology system cannot? This juxtaposition is how a clinician can help the user experience developer tailor an intuitive interface. Physicians are great at continuing education but the majority are not great at, or care to, broaden their knowledge base. We live in a time where on-demand classes exist to learn about machine learning and cognitive neural networks. Not that we would perform these function but in the context of the founding team we can converse efficiently with the technical team to best create a system. If my family member needs care today, the physician who couldn’t care less about all of this is the right person for us. When we need care in 5 years, I am betting on significant improvement in healthcare delivery as a result of the clinical cofounder. For 10 years I wondered if I could be the meditating type. Each time I sat still to take some deep breaths I was pretty easily distracted, felt like I was wasting time or fell asleep. 1. I have read more books. I read biographies, marketing, sales, technology, leadership, entrepreneurship and fiction; 45 books this year on my Kindle. Also I kept up with monthly Harvard Business Review monthly publication as well my radiology journals. As a physician that wanted to learn more about business, this type of daily dedicated reading was pretty awesome. 2. I am better teacher to my residents. I started asking the residents describe the steps of the procedure before we see the patient. I have them discuss every step of the consent, positioning, prep, anesthesia and sampling before an ultrasound guided biopsy. This 3-4 minute investment in time has paid off with much smoother procedures and this type of visualization allows them to practice twice for each procedure. Once with me and words and once with the patient. If it is good enough for Phil Jackson and the Bulls, it is good enough for me. 3. I can better adapt to unforeseen challenges. In addition to my radiology interpretive duties, I am also the head of the diagnostic division. I have over 50 technologists at 5 locations and we deliver over 100,000 x-rays per year. Despite engaged leadership and well thought operating procedures, things happen: maintenance, personnel, safety, supply and customer service. There are emails, phone calls and knocks on my door with less than ideal news. Over the past 12 months, I have been able to more calmly prioritize the true emergencies and separate them from the enormous inconveniences. I have been able to better delegate important tasks to others to maintain perspective. Most importantly, I am very rarely reactive. 4. I am a more relaxed driver. Granted I spent most of my twenties in Los Angeles and DC. Anything after that is significantly less hectic. With that, there are driving frustrations everywhere and they bother me less. 6. I eat better. Many busy people, physicians included, wait until they are hungry before choosing their food. I definitely have a schedule for eating to include 100 calorie snacks at 10am, 2 and 4 (I found 100 calorie bars on Amazon that I like and I buy them a case at a time and keep a few in my white coat. Two apples are included each day too.) I don’t think I needed to meditate per se to do this, but I didn’t do this before and possibly it is a result of my overall commitment to wellbeing. 7. I answer the phone nicer at work. This is a weird one, I know. I took a step back and thought that yes, the only time the phone rings is when there is bad news or someone needs something, but despite my grouchiest greeting, it still rang again and again. So, somehow in the past 12 months, I have learned to accept the ringing phone as a reminder. A reminder, and maybe a challenge, that despite whatever is said on the other end of that device I can handle it. Calmly. I’d love to hear your comments. Have you tried to meditate? Have you had any struggles? Obesity in a radiology report? What do the blue arrows represent? Should my report say “normal” if this is the only finding? Should I include: Correlate with risk factors for metabolic syndrome? 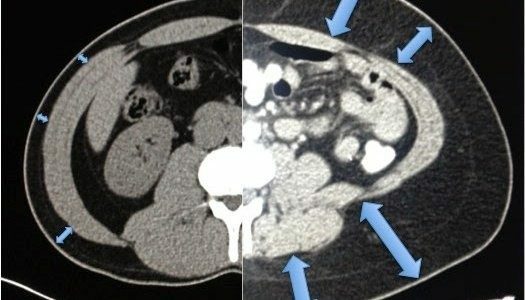 The blue arrows are subcutaneous fat, for my non-radiology colleagues. I’m very interested to hear primary care, radiology and other points of view. How many of these do you use to help manage stress? Can you remember how it felt to be a real patient? How often do these make it in your schedule? How do you feel when you are stressed out? Getting close to the edge or breaking point? Do you recognize it? Has your medical or health training helped you? Before, during and after your training have you seen your stress management improve? Do you think your patients manage their stress well? Do you ask? Do you want to know? Do you have a resource? Given the volume of self-help books, apps and websites I don’t think we are lacking content. I think we as a community are lacking guidance. Consider offering stress management advice to your patients. Try and remember how it felt to be a real patient, before your training, and how great it would be to get some good “life advice” in addition to good therapeutic advice. Our patients expect us to be experts in our field. They expect us to know our jobs. They should. They can also expect us to address some baseline stress and anxiety associated with an encounter. This is a link of my personal wellness week. How I schedule my days so I feel ready to meet the challenges of the day leaning forward. How I put my health first. Literally first in the day and I invite you to join me. Every weekday for the past 7 months I have adopted this schedule. Full disclosure, I was already pretty physically fit but I wanted to balance my life. I wanted to face stresses at work with calmness without being perceived as aloof. I wanted to lead my team without being pushy. I wanted my weekends to be fun and my nights restful with 6-8 hours of continued sleep. Quiet breathing exercises – using mostly “5MinRelax” iPhone app, but I mix it up. Reading, usually a business book. I recently read Delivering Happiness, which was great. 9:00 pm In bed reading with Kindle (Easier on my eyes then iPad). Only fiction or other pleasure reading. 9:30 Sleeping, at the latest. A few other notes: I personally have a salad or sandwich for lunch and a large salad for dinner Monday through Friday. On the weekends I make reasonable choices but make exceptions if I am at a football game or out with friends, for example. In choosing to to plan meaningful time for myself, I feel better. What is more important than that? 1. Freakonomics was the gateway for me. The off kilter thought process, long range data evaluation and the deep-dive in to cause and effect thinking clicked. 2. Supercrunchers hammered it home. A/B testing. The power of large numbers. Data is good. 3. Nudge was a nice next step. Opt in or out of your retirement contribution? How much energy is my neighbor using? Wow, I should cut back. You know the story of the ice bath and kidney snatcher? Why do you remember it? Click here for the rest of my short book review.